Inspiration for this dinner? Two dishes that are bound to be on heavy rotation this summer. So straightforward and unfussy, yet both so luxurious in texture and flavor. 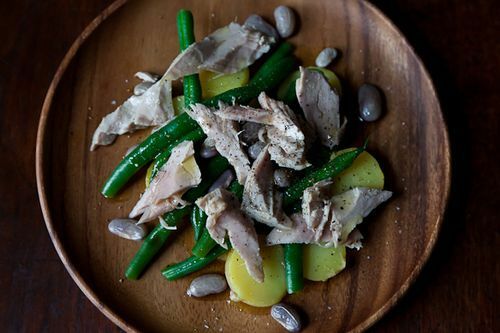 A fat tuna steak slowly poached in olive oil is scattered around a plate with potatoes and green beans like a sort of deconstructed, lazy Nicoise and a cheery pink homemade sherbet (no ice cream machine required!) to finish. A weeknight meal worthy of a Saturday night dinner party. We assume you have olive oil, sherry vinegar, milk, sugar, garlic, salt, and lemons. If not, you'll need them, too! 1. Pop the strawberries in the freezer (they need about 1 hour). Put the bowl and blade of your food processor in the fridge to chill, too. 2. Nestle the tuna into a pan with the oil, thyme and garlic and let it poach. While the tuna cooks, boil and slice your potatoes and blanch the green beans. 3. When the tuna is done, assemble the salad in a way that pleases you. 5. Still a little peckish? Feeling in need of refreshment? Remember those strawberries in the freezer? Pull 'em out! 6. Pulse them up with milk and sugar. Ta da, like frosty magic -- sherbet! Yum! Right up my alley. We tend to eat like this all summer.